Description: 2.3 mil thick PVC natural specialty rubber carton-sealing tape. This tape has a chemical resistant, low stretch, UPVC (unplasticized polyvinyl chloride) film, coated with high quality, pressure-sensitive solvent natural rubber adhesive for consistent closure of corrugated linerboard boxes. 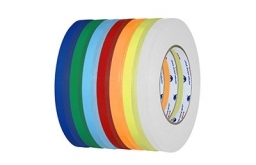 The tape provides fast, positive bonding on "problem" applications, such as high recycled content cartons, rough or ultra-smooth cartons, heavy ink coverage, dusty and/or dirty environments, humid conditions and temperature extremes.